BEAD POOP: Definition: (1) the crumbly, dirty remnants of bead release left in a lampwork bead’s hole once it has cooled and the mandrel removed; (2) the powdery crap you’ve learned to clean out of mass market lampwork beads so it doesn’t leave a mess all over your design; (3) the chunks of clay inside your bead holes that you eventually learn should be reamed under water so you don’t inhale all that dust. Bead poop. Yup, that’s what you’re seeing. Now if you’ve ever bought mass market, lampwork beads like these, then you know exactly what bead poop is and how much of a pain it is to remove. The beads above are from my old glass bead collection, purchased about 12 years ago (long before i ever knew anything about artisan lampwork) and at the time, very popular with my customers. Until I discovered artist-made lampwork, I accepted these glass beads as among the best I could find, bead poop as a normal part of bead buying and had an assortment of reamers to clean it out on my own. So why is bead poop the topic of the day? Because it’s a such simple thing yet one of the key differences between beads made by individual lampwork artists and factory-made, mass market lampwork beads. Yes, both are made of glass. Sure, both are made by hand. And of course, both came off the torch with their holes filled to the gills with chunks of powdery bead poop. 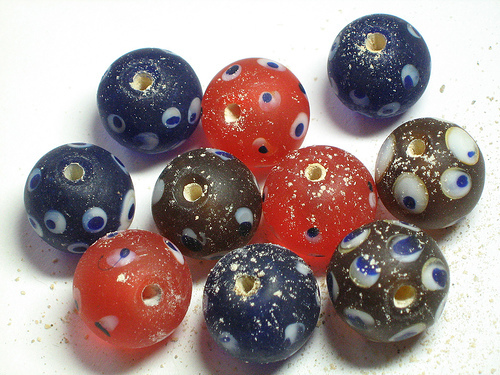 Lampwork artists clean out their bead poop. Reaming bead holes is a sucky job (even for us) so we don’t make you do it. And we won’t use just any bead release. We worry about it. We discuss it. We even argue about it. We hound bead release makers about improving their product and expect them to follow up. We constantly experiment with multiple bead release formulas and various types of diamond reamers to figure out the clearest path to a completely poop-free bead. You may not know this but lampwork nirvana is a transparent bead with a completely clear (not frosted) hole. It means we’ve found that perfect combination of a bead release strong enough to securely hold the bead on the mandrel while we’re making it yet smooth enough to leave a completely clear hole. And it means that one of the many reamers we’ve tried has just the right grade of fine diamond grit to clean out every last scrap of bead poop without also scratching up the inside of the glass. Because we care. Every sale is an affirmation that one more person out there has become informed enough to appreciate what each of us has worked so hard to create. Because we know you could have bought any of the gazillions of inexpensive, mass market glass beads out there but instead you bought ours. Each and every purchase makes it all worth it: the hundreds (or thousands) spent setting up and stocking our studios; the many hours bent over the torch mastering each lampwork technique and exploring the possibilities of each rod of glass; not to mention the time spent ducking exploding glass, nursing burns and blisters, calculating ventilation, oxygen and fuel requirements, and researching the latest developments in hot glass, equipment or a new source of design inspiration. When you buy artisan lampwork, you’re not just buying a poop-free bead. What you have in your hand is the accumulated effort of everything that one lampwork artist has struggled to achieve since they first sat behind a torch. And that my dear readers, is the significance of bead poop. I am glad to know (as a VERY new glass artist) I am not the only one who thinks that bead poop is the worst chore around. I have been cleaning mine by hand with a cheap bead reamer, and a pipe cleaner. It isn’t fast, but it turns out very pretty. (Usually), but I am still making a mess getting bead release on the outside of my beads. Some days are better than others HUH? It’s been a while since I’ve come across such an interesting post. Never in a million years would I have thought that reading all about bead poop would turn out to be the most fascinating/captivating part of my day. THANK YOU!